While driving in an unfamiliar city, most people take the instructions from their Global Positioning System (GPS) device for granted — never pausing to wonder how the disembodied voice knows their destination is just two left turns away. But GPS, in fact, is a marvel of space-based technology. The GPS receivers in cars and smartphones calculate locations, velocities and directions based on signals pinged out by a constellation of 24 satellites orbiting thousands of miles above Earth. GPS began its life as a strictly military technology, and to this day the United States Air Force operates and maintains the satellites. But GPS has now flooded into the everyday lives of billions of people around the world, letting them know where they are at any moment — and how to get to a better place. The Air Force maintains a constellation of at least 24 working GPS satellites, each orbiting about 12,500 miles (20,117 kilometers) above the Earth's surface. These satellites, which circle the planet every 12 hours, emit continuous navigation signals. Receivers on the ground snag these signals out of the air, using them to calculate time, location and velocity with high accuracy. The technology has also found its way into many spheres of modern life, helping scientists mark their field sites and assisting delivery companies in tracking packages. The roots of GPS technology date back to World War II, when the U.S. and British navies deployed navigation systems that used ground-based radio signals. But the idea really got off the ground when the Soviet Union launched Sputnik — the world's first artifical satellite — in 1957. Just days after Sputnik's launch, American scientists noticed that they could pinpoint the satellite's location based on the Doppler shift of its radio signals — a measure of how the wavelengths seemed to stretch out or contract depending on the satellite's movements. This got the researchers thinking about creating a space-based navigation system. In the late 1950s, they began developing and testing satellite navigation technology, and the U.S. Navy deployed the operational Transit satellite system in the 1960s. Then, in 1973, a group of Pentagon officials decided to create a "defense navigation satellite system," laying the groundwork for a system called Navstar-GPS — what we now know simply as GPS. The U.S. Air Force sent the first GPS satellite into orbit in 1978, and many other launches followed over the years. By the early 1990s, the system was functioning, and its capabilities were demonstrated during the first Gulf War. Allied troops relied heavily on GPS to navigate the featureless Arabian desert, Air Force officials have said. By 1995, the 24th GPS satellite was in position, marking the system's arrival at full operational capacity. GPS satellites send out two signals — one for military use and one for civilian applications. In the early years, the civilian signal was intentionally degraded for national security purposes. But that changed in 2000, when President Bill Clinton ordered the degradation turned off, making civilian GPS much more accurate. The decision has helped GPS become a more reliable tool for private citizens all over the world. The capabilities of GPS are constantly improving, as the Air Force launches newer, more accurate GPS satellites on a regular basis. 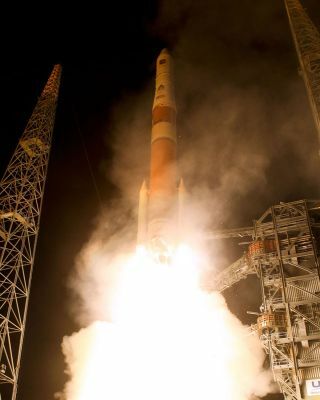 The U.S. federal government is committed to providing a minimum of 24 operational GPS satellites on orbit, 95 percent of the time. There are currently more than 30 satellites up, providing some margin for error. While GPS is the most widely used system around the world, it's not the only space-based navigation network out there. Russia has its Glonass system, for example, which the Soviet Union began to devise back in the 1970s. The European Union is planning a navigation system called Galileo, and China has already launched multiple satellites for its Beidou ("Compass") system, which it hopes to have operational by 2012.